Cherie Priest | What a book! “Boneshaker” is full of Steamy goodness. Like zombies? Enjoy Steampunk? Would you like to see the two genres meld together in wonderful symbiosis? Then you need to read “Boneshaker” by Cherie Priest. It’s quite a ride! Set in a slightly altered universe where Seattle is closed, walled-off and overrun with zombies created by a strange gas called ‘The Blight’ that was released during an attempt by a mad scientist named Leviticus Blue to tunnel his way to gold. His machine – the Boneshaker – destroyed the city and left little in the way of survivors once the zombies got through with them. The story follows Briar Wilkes, widow of Leviticus Blue, as she dons a gas mask and finds her way into Seattle in search of her son. Along the way, she encounters Chinese laborers, cyborg-ish barkeeps, swashbuckling zeppelin pilots, and of course, quite a lot of zombies trying to nom her flesh. I loved it. The pace was great and I admire the way Cherie Priest blended so many elements from different genres together in such a seamless way. I discovered this book via Twitter where a number of writers I enjoy were touting her book. 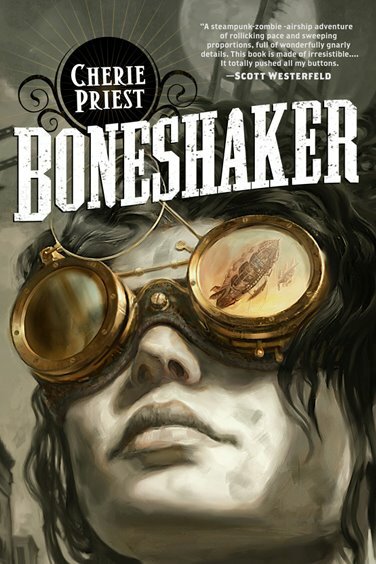 At the time I was beginning to enjoy my own love affair with Steampunk and I found “Boneshaker” to be the perfect introduction to Steampunk fiction. So, what the heck is Steampunk? Well I’m glad you asked. Click here and find an excellent primer on this fun genre. YOU’LL LIKE “BONESHAKER” IF: You’ve seen movies like “Wild, Wild West”, “A League of Extraordinary Gentleman”, or enjoyed books by Jules Verne. If you like Victorian style mixed with modern advances. If you enjoy wearing brass goggles and bustles, or cravats. If you own a pocketwatch. If you’ve ever been been shunned because of your past, lost your son, and would do anything to get him back, even if it mean getting involved with shady zeppelin pilots delivering contraband to Blight survivors… This book is for you. Seriously, it is a fun, page-turning read. “Boneshaker” gets five out of five stars from me. Follow Cherie Priest on Twitter or visit her website.